Has A Major Clone Wars Character Already Appeared In Star Wars Rebels? Obi-Wan Kenobi made a disembodied appearance in the pilot of Star Wars Rebels, but has another important character from Clone Wars also had a cameo? Some speculation about last week's episode has just gotten a bit more intriguing. In the episode "Out of Darkness," we hear Hera talking to her contact, Fulcrum, who helps her arrange anti-Imperial gigs. Hera tells us very little about Fulcrum, and while the voice over the comm sounds more on the male end of the spectrum, Fulcrum could very well be using a voicechanger and is never referred to be Hera as "he or she." Dork Side of the Force also notes that there is no voice actor listed to Fulcrum, fueling speculation that Fulcrum is someone we've met before. One name that's being thrown around a lot? Ahsoka Tano, Anakin Skywalker's one-time Padawan who was expelled from the Jedi Order before Order 66 was executed. Chances are that Ahsoka is still alive and kicking dirt in the Empire's eyes. The folks at RebelsReport have even tried to figure out Fulcrum's identity by playing with the pitch on Fulcrum's conversation with Hera. At one point along the pitch spectrum (around 0:26), Fulcrum does sound an awful lot like Ahsoka. It's still very much speculation at this point, but Ahsoka as Fulcrum does make a bit of sense. 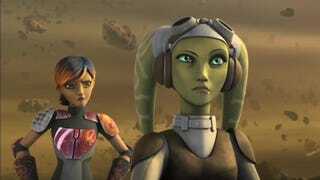 It would explain why Hera is so cautious in protecting Fulcrum's identity. (At this point, Ahsoka would be a major prize for anyone who could haul her back to Vader.) And Ahsoka certainly has the montrals to help organize a resistance movement. But there are plenty of other possible friends (and foes) who could be working as Hera's contact.